PENSACOLA, Fla., April 3, 2019 /Christian Newswire/ -- Leaders of the biggest charismatic revival movement in modern times are planning for a fresh move of the Holy Spirit this fall – 25 years after a series of powerful outpourings shook America and the world. 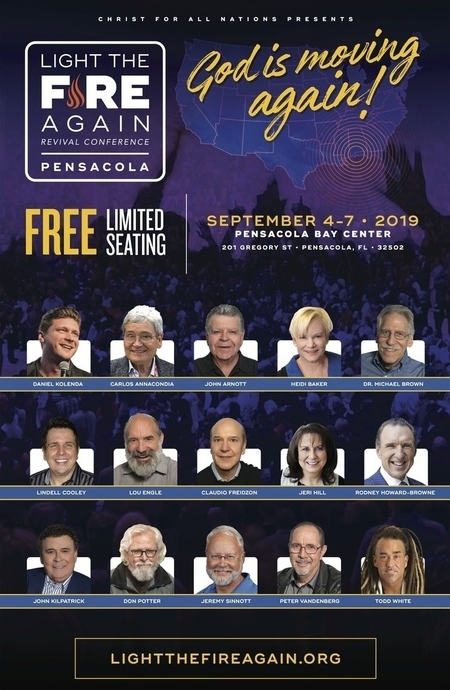 "Light the Fire Again Conference 2019 -- Pensacola," spearheaded by Christ for All Nations, will take place Sept. 4-7, 2019, in Pensacola, Fla. – the location of the Brownsville Revival/Pensacola Outpouring in 1995. Registration for Light the Fire Again -- Pensacola is free at the Christ for All Nations website at www.cfan.org. "The waves of revival that swept around the world in the 1990s have left a lasting impact on millions of people around the globe," said evangelist Daniel Kolenda, leader of Light the Fire Again. "We're believing God to rekindle the flames of revival and see a mighty move of the Holy Spirit sweep across the earth, stirring the hearts of this generation. We will celebrate history and, together, empowered by the Holy Spirit, we will make history." revival movements of a quarter-century ago. They include Rodney Howard-Browne, John Arnott, Claudio Freidzon, Carlos Annacondia, John Kilpatrick, Heidi Baker, Todd White and others. "We are expecting people from all over the world to have an encounter with God like never before," said Kolenda, who also will be preaching at the Pensacola event. "You won't want to miss this once-in-a-lifetime gathering." The Pensacola event will follow "Light the Fire Again Conference 2019 -- Toronto" to be held May 1-4 in the city where the Toronto Blessing movement started in 1994, spreading revival worldwide. In the United States, revival fires began in the early 1990s under the ministry of South African-born evangelist Howard-Browne in upstate New York where it was reported that the power of the Holy Spirit "fell without warning" during Howard-Browne's meetings. In 1995, the Brownsville Revival, also known as the Pensacola Outpouring, continued the stream of revivals that broke out alongside the Toronto Blessing. Over the course of five years, an estimated four million people attended the revival meetings at Brownsville Assembly of God in Pensacola, led by Brownsville pastor Kilpatrick. More information about "Light the Fire Again Conference 2019 -- Pensacola," including a full list of speakers, can be found at www.lightthefireagain.org.